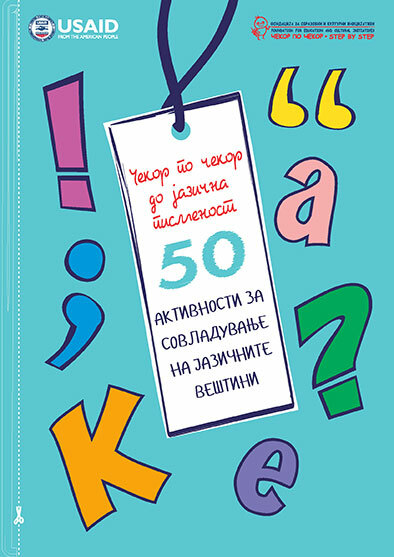 The Macedonian handbook Step by Step to Literacy- 50 activities for improving student literacy skills is composed of 50 activities divided in six teaching and learning areas (Listening and talking; Reading and writing; Language; Literature; Verbal expression and creative writing and Media culture) as defined in the Macedonian national teaching curricula for the first three grades. The handbook describes each activity, including the necessary materials, the preparation process and the method of conducting the activity. Additionally, each activity is supported with one or more photos presenting the preparation process. All of the activities can be easily replicated in the classroom with affordable and easy-to-get materials. This handbook is a useful resource for the primary grade teachers who want to expand their array of innovative and effective strategies for improving student literacy.